Old transaction, fraud because of weak security, hacking, are the most common problem in exchange. It is important to do research before choosing a safe platform. Instead, one of the biggest problems in the cryptocurrency industry today centers on pump-and-dump scheme, and exchanges are responsible for preventing this fraud. Now everything can be overcome with Crypt-ON and we don't need to be afraid anymore. Crypt-ON is a P2P platform built on blockchain technology to provide safe and secure trades in cryptocurrency. Next I will review the platform P2P built on blockchain technology. Before going to the core of the topic, I will give a little explanation about blockchain technology which makes the platform have a strong level of security when using blockchain technology. Blockchain technology is one system that does not use third parties in the process of data exchange which in this case occurs in the transaction process. The Blockchain system does not use third parties as a center, but uses many parties or computers that are spread on the network itself. This will make irresponsible people have trouble do burglary on the system and disturbance maybe small will occur. Not only that, this blockhain technology also brings benefits, including track transaction, because transaction data will be found soon because public can view transaction history in real time. Bitcoin is one that applies Blockchain technology. Okay, we go to the topic. Crypt-ON is a P2P platform built on blockchain technology to provide safe and secure trades in cryptocurrency. 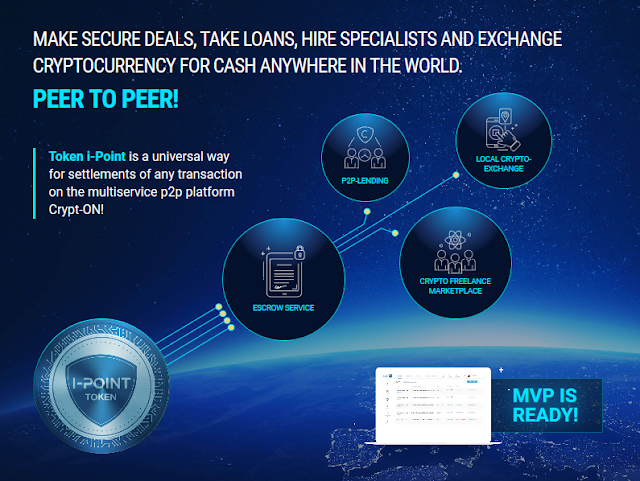 Crypt-ON is a place where people meet, make deal, get loan for their project, exchange digital assets for money, and look for work or performers for their task, all by using cryptocurrency for payments. 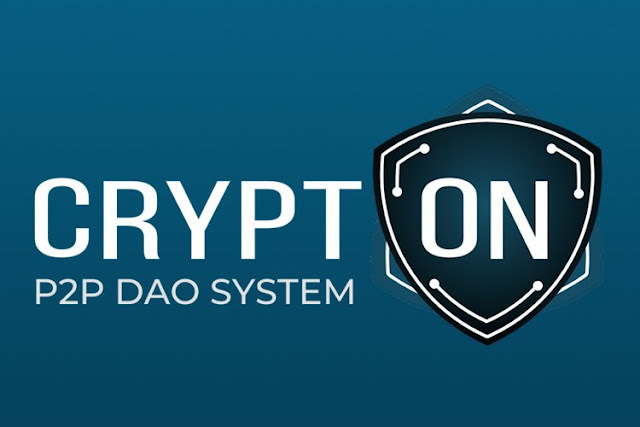 Crypt-ON is not the first P2P platform to use blockchain technology, but Crypt-ON is the first platform to provide transaction insurance in to additional the protection interests of all parties. This proves the seriousness of Crypt-ON as a P2P platform that very secure. Not only that, Crypt-ON too provides the opportunity to borrow/lend in cryptocurrencies, and this is done without participation of an intermediary. The use of a rating system that determines the level of reliability of potentialborrowers will reduce the number of defaults to a minimum. And platform Crypto-ON too provides independent professionals in the field of the crypto industry the possibility of finding remote work, and companies or project the possibility of hiring such specialists. The parties can directly agree on the execution of various types of work, using the cryptocurrency in their calculation. • DAO​ - decentralized autonomous organization. It is a new form of economic organization in which there is no vertical hierarchy, and each participant is a full co-owner. This is a new type of economic organization, in which there is no vertical hierarchy, and each participant is a full co-owner. The DAO is independent of political and financial institutions and operates on the basis of the rules laid down in smart-contracts, and it uses cryptocurrency instead of fiat money. direct mutual lending in which the issuance and repayment of loans are carried out without intermediaries such as banks or other investment organizations. ► LibreCash, the stability of which is ensured by emission/remission in the blockchain instead of guarantees in the fiat currency (LibreCash is not bound to any traditional asset). this digital token contains a record of all the platform user operations in the form of a trust rating. 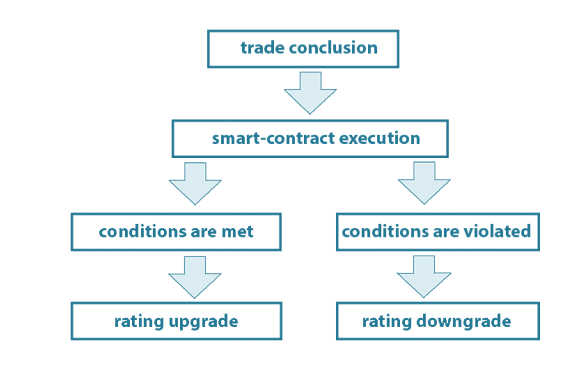 In particular, in timely compliance with the terms of a contract in the form of an upgrade of the rating, in case of delay in the performance of the contract, or in the form of a downgrade in case of non-fulfillment—it appears in the form of an "Attention! (Alert!)" mark. the participation of an independent intermediary/trustee based solely on the consent of all parties to the transaction, expressed in the deposit of the transaction price with the condition of its subsequent transfer to the interested person only if all parties of the transaction fully comply with the terms of the contract. There are many excellence of Crypt-ON that we might not (blockchainann) explain in detail. Maybe here I will abbreviate the things that are important for knowledge every one about the Crypt-On vision and mission. Technologically​, we see a solution to these problems in the creation of a P2P platform, which includes a set of interrelated services that use cryptocurrency for payments. The use of innovative tools, such as smart-contracts, can translate the ideas that seemed utopian a few years ago into reality and effectively solve the problems that traditional systems do not cope with. We are confident that the blockchain is not only able to neutralize the risks of working in online space, but for the first time in history, to make an entirely honest, transparent, non-corrupt rating of borrowers, sellers, and performers singular for all countries and resources. For this, a trust token, a unique reputation token containing a history of all the participant's transactions, will be used. It will upgrade the rating each time the loan is returned, the work is performed, or the goods are delivered on time and qualitatively, and downgrade it in case of delays or defaults. Users of the Crypt-ON platform will be able to not only operate cryptocurrencies for their tasks' implementation, despite the existing restrictions of state/financial institutions but also earn cryptocurrencies in various ways. With the transition of the platform to decentralized management – you can participate in its development and make important decisions of any level of priority and complexity – from making conclusions on disputed trades to strategic development issues. The Crypt-ON mission is to unite people from all over the world who are involved in the crypto industry, allowing them to interact quickly and comfortably with partners in a variety of areas at all stages of cooperation.